The EU-Malaysian Chambers of Commerce and Industries (EUMCCI) launched its annual booklet on "Trade Issues & Recommendations". The booklet was launched and presented to YBhg Dato' Sri Norazman Ayob, Deputy Secretary General (Trade) at the Ministry of International Trade & Industry (MITI) at the Trade & Investment Forum 2019, which aims to achieve high level dialogue between the Malaysian business community, the Malaysian policy makers and government representatives. Gregers (IEN), in his capacity as Chairman of the Green Building committee, were among the speakers. IEN has been invited to give a talk at the Asia Young Designer Awards XChange 2019. This event, which promotes exchange of ideas within the design industry, nurtures young design talents in Asia with connection to 800 educational institutions at more than 15 geographical locations. Last year saw 1200 submissions. This year, the theme of the event is "Forward : A Sustainable Future" and IEN will share its thoughts on what a sustainable future really means and inspire the students to the embrace the important role of design. Other speakers include YBhg. Datin Wong Meng Lee (Nippon Paint), Mr Edward Chong (IJM Land), Ar. Alif Arif Iskandar Abdul Wahab (Veritas Architects), Ar. Wooi Lok Kuang (Wooi Architect) and Ar. Sarly Andre Sarkum (SA2 and chief judge of AYDA). The event was held in the naturally ventilated event space under the green roof of The Arc @ Bandar Rimbayu, a suitable venue for this event focused on sustainability. IEN Consultants successfully worked with Shell Malaysia to achieve GBI certification of 2 of their existing Retail Fuel Stations in Malaysia. Shell Station Damansara Jaya and Shell Station Taman Connaught became the first retail fuel stations to be awarded green certification not only in Malaysia but also in Asia Pacific. With IEN Consultants experience and success with other first of kind buildings achieving ambitious green certifications, we were able to work with Shell to achieve the goal within 6months of being brought onboard. This achievement is inline with Shell's commitment to reduce carbon footprint of retail fuel business by 50% by year 2025. IEN has completed the first LEED BOM v4 gap analyses for Malaysian government hospitals. The final reports were submitted after hospital site visits, engagement sessions with the facility managers at each hospital as well as presentations and feedback from facility management. The Ministry of Health (MoH) of Malaysia is pursuing LEED BOM (formerly LEED EBOM) certification for all government hospitals of the next five years. IEN was invited to give a talk at the Seminar on Awareness Towards Zero Energy Buildings (ZEB) on the topic of "ZEB Renovation for Existing Buildings". Apart from presenting tropical case studies of energy efficient building retrofits (both commercial and residential buildings), the presentation also shows the impressive achievement in Denmark of achieving 50% energy savings for the entire building stock. This was achieved through a combination of economic retrofit incentives, environmental taxation and mandatory building energy labelling. It should be possible to achieve something similar in Malaysia - a development that will be accelerated insofar energy pricing follows the 'polluter pays' principle to create a level playing field between energy efficiency and energy supply. The seminar was organised by the Sustainable Energy Development Authority (SEDA) and the Japanese Business Alliance for Smart Energy Worldwide (JASE-W). Gregers (IEN) was invited to give a talk about "Bicycle commuting in Kuala Lumpur" at the inaugural Malaysian Urban Forum (MUF2019) inside the session about Urban Mobility and Bicycle Culture. The keynote speaker for the conference was deputy primeminister of Malaysia, Datuk Seri Wan Azizah Wan Ismail, who delivered a good speech that quoted many of the same arguments from our article "Traffic jams cost us billions", namely that the annual cost of congestion in Kuala Lumpur annually amounts to RM20billion as 1 million hours are wasted in traffic daily. As well as the fact that the car-based culture adversely affects public health, with the majority of Malaysians not getting sufficient exercise and Malaysia having become the fattest nation in Asia will the multitude of associated adverse health effects that come with being overweight and/or obese. So, arguments for making more livable cities with good and safe pedestrian and bicycling networks that can make the general public exercise as part of their daily commute are plentiful. In addition, Gregers also lent his electric pedal assisted cargobike to be exhibited at the conference. It created much interest, as cargobikes are seen to be an important element in the future of urban transportation, as it in many instances can replace the need for a car or motorbike. For example, the Gregers' Omnium cargobike, which can carry a total load of 175 km, is widely used by bicycle couriers in Copenhagen, Denmark. Bicycles are pollution free, silent, reduce traffic congestion and improve public health. IEN has contributed to the publication "An Architecture Guide to the UN 17 Sustainable Development Goals", which was pre-launched at COP24 in the Nordic Pavillon in Katowice, Poland. The intention of the book is to provide an architecture guide to the Goals. The 17 chapters of the book present how each Goal is defined by the UN, outlines how it interacts with the built environment and gives examples of realized projects that illustrate architectural contributions. IEN's project "Paramit - factory in the forest" is featured in chapter 7 under the "Affordable and Clean Energy" goal, which must ensure access to affordable, reliable, sustainable and modern energy for all including improvements in industrial efficiency. IEN has been invited to attend the annual GreenRE Sustainable Design Awards, giving recognition to the greenest building projects in Malaysia. The event will be officiated by YB Yeo Bee Yinn, the Minister of Energy, Technology, Science, Climate Change and Environment (MESTECC). IEN (Gregers) in his capacity of being Head of the Green Building committee has been invited to attend the annual flagship event by the EU-Malaysian Chamber of Commerce and Industry (EUMCCI). Moreover, Gregers is nominated for the award "Best Sustainability Leader". The other award categories, which are consistent with the European Union’s sustainable development values, are "Best Sustainability Reporting", "Best Innovation in Sustainability", "Best Social Impact", "Best Environmental Impact", and "Best Sustainable Palm Oil Leader". The programme aims to identify, qualify and promote business excellence in Malaysia from companies that have demonstrated extraordinary performance in the field of sustainability to the long term benefit of Malaysian society and economy. The invited guest of honour is YAB Datuk Seri Dr Wan Azizah Wan Ismail, Deputy Prime Minister. IEN has been invited to be on the Crit Panel for the Master of Science of Integrated Sustainable Design (MSc ISD) at the School of Design and Environment, National University of Singapore (NUS). The Crit Panel is lead by Dr. Nirmal Kishnani (NUS Architecture), with the other members being Hossein Rezai-Jorabi (Webstures), Chintan Raveshia (Arup) and Wong Mun Summ (WOHA). IEN has been invited back to give a 1 hour lecture for the GreenRE Manager’s Course 17th Intake in Petaling Jaya, Wisma Rehda. IEN will be giving the lecture on "Green Innovation Features" in the building sector. Last time, this lecture was very well received by the students, because IEN Consultants - being the pioneering green building consultant in Malaysia - has a vast portfolio of completed green, energy efficient and innovative building projects in Malaysia and the region. As such, the lecture showed the students that truly green and innovative building projects have already been successfully built, something several of the students said that they found highly inspirational. The lecture will include the topics of innovative energy efficient technologies, innovative daylight solutions, innovative thermal comfort, innovative sky cooling, innovative ways to influence green behaviour (the "nudging" effect), innovative natural ventilation and innovative building integrated renewable energy systems like BIPV (building integrate photovoltaics) and PVT (photovoltaic thermal). IEN has been invited to give a talk entitled "Smart Building: Buildings that learn". While sophisticated building management systems are becoming common place, most are not used to their full potential. Moreover, non-optimal control strategies often remain in place for years on end with adverse effects to energy efficiency and occupant comfort. With this presentation, we are asking the question: Wouldn't it be great, if buildings could learn? This way, the buildings can optimize themselves without depending on a building operator. 2nd FGD "Formulation of Urban Regeneration Policy"
IEN has been invited to participate in a Focus Group Discussion titled "Formulation of Urban Regeneration Policy for Major Cities in Malaysia". The FGD, funded by the Ministry of Finance (MoF) under Institut Penilaian Negara (INSPEN), will cover topics such as Sustainable Developments in accordance to the New Urban Agenda (NUA), affordable housing, land laws and urban regulations and funding mechanisms for urban regeneration, among others. The 1 day programme will be administered by UTHM and will use Kuala Lumpur as a case study. 1)The UN Intergovernmental Panel on Climate Change’s (IPCC) newly published report (SR15) on climate change came calls for urgent action to phase out fossil fuels and warning that we only have 12 years to avoid a climate catastrophe. This raised the question: Is the World finally going to take climate change seriously? Will we finally see a paradigm shift with respect to our economic system and economic thinking that entice us to save the World - and thereby also ourselves? To help us shed light on these important and complex issues, and to lead the discussion on what policies we should propose for governments around the World, we invited guest speaker Steve McCoy, one of Malaysia's foremost environmental intellectuals. The talk was summarized into an article by Gregers (IEN), who also gave a summary of the latest IPCC climate change report. Lecture 1: "Passive vs. Active Systems/Design"
Lecture 2: "Net Zero Energy Buildings"
Lecture 3: "Case Studies: Energy Efficient Buildings"
Lecture 4: "Building Sector’s Important Role in Achieving the Climate Change Reduction Goals"
The other lectures are given by Dr. Siu-Kit (Eddie) Lau (Department of Architecture) and Veronika Shabunko (Solar Energy Research Institute Singapore, SERIS). The student assignment to be evaluated on the last day is on the topic "Integration building scale and urban scale". IEN worked with Hijjas Kasturi to come up with an interesting, innovative and zero-energy affordable public housing scheme, which is exhibited at the "MY.HSE - The Malaysian Future Housing Case Studies" exhibition at Damansara City Mall until 2 Sept. 2018; the exhibition is part of the KLAF2018 (Kuala Lumpur Architecture Festival 2018). This ideas' exhibition showcases some of our new interesting concepts, such as sky cooling to provide free cooling at night and doubling up as solar collectors for hot water production in the day. Moreover, the multi-storey public housing block is assembled in a LEGO-like fashion, namely from prefabricated volumetric cubes assembled on site. By paying careful attention to providing cross-ventilation for each room, ensuring energy efficient appliances and controls as well as a real-time occupant feedback system on the monthly solar-energy provision for each apartment, the public housing development becomes ZERO-energy. In other words, the annual energy consumption of this highly energy efficient building matches that of the solar panels mounted on the roof. And with an energy bill of zero, this public housing development also achieve affordability during operation. IEN has been invited to be a Panelist for the first Zak World of Facades conference in Kuala Lumpur. The panel discussion will be on the topic of "Sustainability and innovation through facades" exploring the need for sustainable façades and how the comply to local Green Building regulations, as well as thermal performance in curtain wall & fenestration (OTTV) and dynamic shading techniques. The panelists are Gregers Reimann (IEN Consultants), Alif Arif (Veritas Design Group), Eduardo McIntosh (Grimshaw), Sarly Adre Sarkum (SA2) and Chris Wong (C'Arch Architecture + Design), and will be moderated by Serina Hijjas (Hijjas Associates). This event is the World’s largest façade conference series, which is expected to draw more than 300 leading architects, developers, façade experts, main contractors, government officials, consultants etc. Interestingly, attendance is by invitation only. IEN has been invited to moderate the Sustainability Design Forum at the Kuala Lumpur Architectural Festival 2018 (KLAF2018), which is the biggest architectural conference in Malaysia. 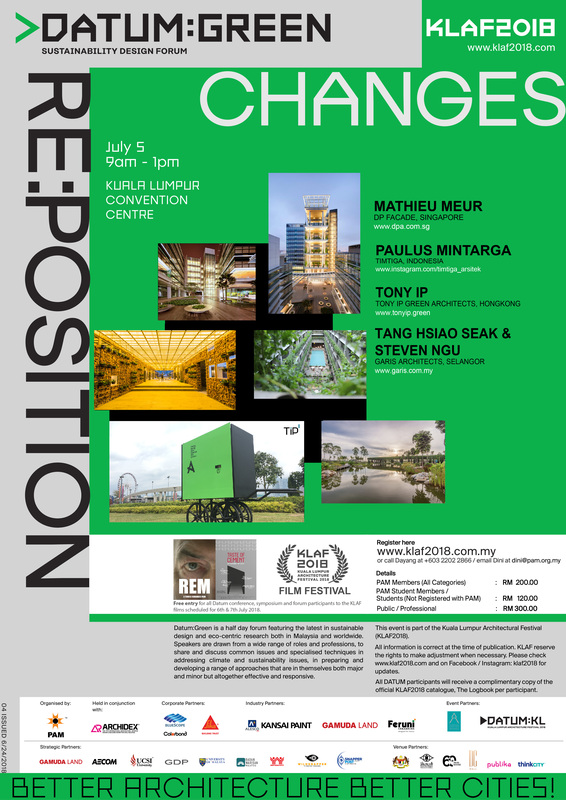 Speakers at the session include Mathieu Meur (DP Facade), Paulus Mintarga (Timtiga), Tony Ip (Tony Ip Green Architects) and Tang Hsiao Seak & Steven Ngu (Garis Architects), who will be speaking on the latest in sustainable design and eco-centric research. The theme of the event is "Better Architecture, Better Cities!" IEN has been invited to give a 1 hour lecture on "Green Innovation Features" in the building sector for the 16th intake of the 3 days GreenRE Manager’s Course held at Wisma REHDA, Kelana Jaya. With IEN Consultants being the pioneering green building consultant in Malaysia since year 2000, we are in a good position to be speaking about innovative green building designs, which includes the topics of innovative energy efficient technologies, innovative daylight solutions, innovative thermal comfort, innovative sky cooling, innovative ways to influence green behaviour (the "nudging" effect), innovative natural ventilation and innovative solution to create connection outside for basement car park. The International WELL Building Institute (IWBI) has recently launched V2 of the WELL building standard and will be providing a short 1½ hour workshop at the IEN Training Room for IEN staff as well as outsiders. The workshop will be carried out by the SEA IWBI Representative, Samantha Allen. IEN has already conducted one WELL training workshop with IWBI and look forward to learning about the updates to the 2nd version of the WELL Standard. The IEN training room has daylight, biophilia and beautiful artwork, so it lends itself very well to the design criteria found in the WELL Standard. IEN has been awarded an Asian Development Bank funded project to green four university buildings in Sri Lanka. The task is to engage with the end-users and ensure that the Design & Build tender brief captures the end-users' needs for adequate facilities, as well as setting a good example for sustainable, green building features including, but not limited to energy efficiency, water-saving and recycling, and natural ventilation and lighting. The name of the four universities are Kelaniya, Sri Jayawardenapura, Rajarata and Sabaragamuwa. The four university extension projects are done in a consortium with Sarly Adre Sarkum Architecture Sdn Bhd (Malaysia) and our collaboration partners in Sri Lanka (Glide Pte Ltd and Design Advocacy Ptd. Ltd.). IEN (Hansong) will be one of the trainers at the upcoming Active House verifier seminar in Beijing on 19 May 2018. The lead instructor for the Active House verifier seminar is Mr. Guenther Gantioler from ActiveHouse Italia. IEN (Chin Hong) has been invited to speak at the Green Technology Conference. The topic of the 1-hour long talk will be "Energy Efficiency Design of Commercial Buildings" and will be drawing on several of IEN's completed energy efficient and green buildings that serves as good case studies with both computer simulated performance data as well as measured performance data during operation. We are happy to announce that our project "Paramit - factory in the forest" is the winner of the FuturArc Green Leadership Award 2018 in the "Commercial Building" category. The jurors' note that the project is a "high-quality design and well-executed project. This project can give an impulse to future factory buildings in (Southeast) Asia, considering the needs of employees". Moreover, the factory project displays "strong command over detail, plus scientific control of glare and thermal heat gain" with a "biophilic design [that] helps to fulfil the physical, psychological and emotional needs of the users as well as helps to boost the workers’ productivity". The award ceremony is on 29 June 2018, Hilton Hotel, Kuala Lumpur. The new iconic MOMA Building & Arts Museum is the first museum in the World to obtain an Active House label. This means that the building has been designed and evaluated in accordance with the Active House principles of creating buildings with good indoor, comfort, low use of energy and with a minimum impact on the environment. IEN Consultants did the Active House submission, which was verified by an independent assessor from Active House. This is one of the first buildings to obtain Active House certification in China. For the first time in 14 years, the biggest green building conference in China was held outside of Beijing, namely in Zhuhai. IEN attended the conference, officially called "The 14th International Conference on Green and Energy-Efficient Building & New Technologies and Products Expo" and took part in the Active House session, where MOMA Building & Arts Museum was awarded with the Active House label, for which IEN did the submission. It was interesting to note from the conference that several speakers voiced frustration with the current state of affairs with green building certification in China, because typically green certification has little if any impact on the design and performance of the buildings. Hence, the Chinese market seems ready to embrace performance based green building systems, like Active House, which aligns closely with how IEN Consultants approaches green building design and certification: Making a positive impact and adding value to the building. IEN was contracted to undertake green building certification training for existing government hospitals across Malaysia. The location of the five training sessions, which focused on LEED v4 BOM (formerly LEED EBOM) certification, were Penang, Kuantan, Melaka, Kuching and Kota Kinabalu. The training sessions were well attended by hospital facility managers, hospital staff and Ministry of Health representatives. IEN has extensive experience in LEED certification and other green building certification in Malaysia and the region, and could therefore draw on their experience and relevant case studies as part of the training. IEN is lecturing at UCSI University for the M.Sc. Architecture course "Computer Aided Modelling and Simulation" (AM523), where the students are taught to undertake building performance simulations on their BIM building models and let it inform their design solutions. This allows the architects to optimize buildings during the design phase, so basic design parameters like building massing, building orientation, window-to-wall ratios, glazing selection, shading and roof insulation are investigated and optimized by the architects from the onset of the project. Apart from teaching computer aided modelling and simulation, IEN is also conveying lessons learned relevant case studies of completed energy efficient and green buildings in Malaysia, especially pertaining to design issues relating to architecture like daylighting and natural ventilation. IEN has been invited to review the new Water Efficiency Calculator, which will be released by the Greenbuildingindex (GBI) later this year. The calculator is an effort to standardize the way the water related credits under GBI are calculated and submitted for green building certification. More details to follow once GBI has officially launched the tool. IEN has once again been invited to give a talk at the Sustainable Energy Technology Asia (SETA) conference in Bangkok, Thailand. This is the major annual conference of its kind in Thailand endorsed by the Thai Ministry of Energy. Though the conference mostly focuses on power supply and management, IEN Consultants contributed to smaller sub-section of the conference concerned with energy efficiency in buildings. Khim Bok (IEN) delivered a presentation on the interesting energy efficient case study of IKEA Cheras (Malaysia), which also has a significant renewable energy component with a 1 MWp solar PV installation on the roof top. IKEA Cheras Store located in Jalan Cochrane, Kuala Lumpur becomes the 1st IKEA Store in the world to achieve LEED 2009 for Retail – New Construction GOLD certification. The IKEA Cheras store opened its doors for business in November 2015 and was the 2nd IKEA Store to open in Malaysia, after IKEA Damansara. In March 2018, IEN Consultants successfully helped Ikano achieve LEED GOLD certification for its IKEA Store in Cheras. From early on in the design stage, Ikano had set a goal for this IKEA store to be more energy efficient, more water efficient and more sustainable compared to the existing stores in South East Asia. Hence, IEN Consultants was employed as the energy efficiency and sustainability design consultants to steer the project towards this goal. Zero use of potable water for landscape irrigation – achieved through smart selection of plants and use of non-potable rainwater as well as recycled greywater. Interestingly, this school has a very high quality MBA program, created in a partnership between long-time MIT Professor Charles Fine and Bank Negara Malaysia (the central bank of Malaysia). IEN took part in many of the interesting talks/trainings/technical visits during the 9th World Urban Forum (WUF9), which was held in Kuala Lumpur and organized by UN Habitat. The theme of the conference was “Cities 2030, Cities for All: Implementing the New Urban Agenda”, which places the Forum’s focus on the New Urban Agenda as a tool and accelerator for achieving Agenda 2030 and the Sustainable Development Goals. IEN has been invited to deliver a keynote address at the New Zealand Academy of Applied Research (NZAAR) international event series on Natural and Built Environment, Cities, Sustainability, and Advanced Engineering. The title of the keynote address is "Reconnecting with Nature", addressing how human beings are hard-wired to be in contact with nature, yet, we spend 90% of our lives indoors. This keynote address raises the question of whether our built environment is sufficiently biophilic, i.e. catering adequately to fulfill the basic human need of being in contact with the natural environment. The presentation includes several local examples of biophilic design solutions and their positive effect on human health and well-being. On the legislative side, some countries have for decades had mandatory requirements for biophilic design. Moreover, several of the green building certification schemes have recently begun to include biophilic design. In our increasingly urbanized World, there is a growing and conscious effort of “reconnecting with Nature”. An effort, where the built environment must play a paramount role. IEN wrote an article entitled "Healthy Bottom Line with Healthy Buildings" published in the January 2018 issue of the Greenplus magazine. The article delivers compelling arguments - including a compelling economic argument - for improving the health and well-being of building occupants. This can be achieved by following the WELL standard, which is focused on human health by ensuring everything from nutritious food and exercise to daylight and clean air for the building occupants. Using our own IEN office as an economic case study, we found that 81% of our monthly expenditure goes to staff salaries, while other expenses (15%) and rental (4%) account for the rest of the expenses. From the employer’s perspective, under the assumption that by following the WELL Standard we would be able to cut in half the annual absenteeism and presenteeism, this would mean that by paying the same salary, a yield of an extra 33 work days is obtained from each employee, corresponding to a 15% increase in productivity. For a 1000m2 fully staffed office, this would mean an increase in productivity worth RM340,000 ($80,000) every year. Quite a significant saving, which proves that "health is wealth". IEN was invited to write an article about new building trends for the December 2017 issue of the Property Insight magazine. Sheena and Gregers chose to write about the new WELL certification for buildings, which slowly is starting to pick up in Asia. What we like about WELL is its strong focus on wellness and health for building occupants and how the built environment can play an important role in achieving this aim. Two years ago, IEN started its first WELL project and more will surely follow. "Best New Building of the World"
Our project "Paramit - factory in the forest" is among the 62 nominees for the "Best New Building of the World 2018" prize, namely the RIBA International Prize, which arguably is the most prestigious architectural prize in the World. Quoting from the Royal Institute of British Architects (RIBA) website, "the 2018 RIBA International Prize will be awarded to a building which exemplifies design excellence, architectural ambition and delivers meaningful social impact. [...] The prize is open to any qualified architect in the world, for a building of any size, type or budget and will be adjudicated by a stellar Grand Jury led by Elizabeth Diller, partner of acclaimed US firm, Diller Scofidio + Renfro, and includes Joshua Bolchover, co-founder of Rural Urban Framework, and acclaimed choreographer Wayne McGregor CBE who will bring his passion and unique perspective on architecture to the Prize." We are overjoyed with being nominated for this world renowned prize. Being nominated is already a major achievement in itself. IEN has accepted the invitation to join the technical panel for the Malaysian green building certification, GreenRe, with the intent of making green building certification in Malaysia better and more ambitious. As such, IEN also occasionally lends its expertise to the development of other green building certification tools like GBI, of which it was one of the founding members. Fun fact: Back in year 2011, when GBI was the only Malaysian green building certification tool, IEN advised against the formation of GreenRe and other green building tools on the grounds that too many different certification tools would confuse the market and could create an unhealthy competition between the certification tools of lowering the bar, i.e. make it easy to obtain certification, which means a green building would not be much different from an ordinary building. Instead, IEN advised to continuously improve upon one national green rating tool, which eventually would be administered by the Malaysian government, not unlike what happened with the UK green building certification scheme BREEAM. Fast forward to today (2017), Malaysia has close to ten different green building certification tools. While IEN has not changed its original stance, we are agreeable to contribute where we can to improve the ambition level of the green building certification standards in the country. A innovative, daring and sustainable design scheme was submitted for the new headquarters of the Master Builders Association Malaysia (MBAM). The design was the result of an integrated design process between IEN Consultants and HOYK Architect / Jeffrey Lee / Jonathon Kok / Wee Jia Foong. The sustainable design features included a self-shading facade with glare-free daylighting and movable solar panels on tracks for shading of facades exposed to direct sunlight. Moreover, the building was designed to induce the wind tunnel effect at ground floor, hence, maximizing the thermal comfort by enhancing simple cross-ventilation. Other sustainable features for this GBI Platinum building included bio-filtration of water, rainwater harvesting, grey water harvesting as well as maximizing energy and water efficiency throughout the building. A total of 79 schemes were submitted for the design competition organized by the Malaysian Institute of Architects, or Pertubuhan Akitek Malaysia (PAM). The winning scheme has yet to be announce. IEN was invited to collaborate with the International WELL Building Institute to conduct a 4-hour WELL workshop training session at Singapore offices of the Japanese company Shimizu. Of the seven concepts under the WELL Standard, which focuses exclusively on human health and well-being, Sheena (IEN) will be responsible for teaching the categories on Light, Air and Nourishment. The workshop is lead by Dr. Nelson Y. O. Tong (IWBI) and Tony Armstrong (IWBI Asia). IEN was invited by the Building Construction Authority (BCA) in Singapore to take part in the 2-day IEA Future Buildings Forum Think Tank Workshop. The workshop, co-organized by the Energy in Buildings Community (EBC) programme under the International Energy Agency (IEA) as well as by the National University of Singapore (NUS) has the title "Transforming Cities in Hot and Humid Climates Towards More Efficient and Sustainable Energy Use". Gregers (IEN) gave a talk about "happiness at work" and what company practices that IEN Consultants has in place in pursuit of this goal. The talk was very well received and generated a lot of interest with a repeated request for sharing the slides; refer to download link below. The talk was given at the Sustainable Brands conference (SBKL 17), which this year has the theme 'Redefining the Good Life', and Gregers took this chance to emphasize the important role of the employer. We spend a huge chunk of our lives at the workplace and often to some degree identify ourselves through our profession. Yet, working is one of the least liked activities, and often, the workplace culture does not exactly help the employees in achieving the Goodlife. At IEN Consultants, we take a different approach, as the well-being of the employees is paramount. The workplace must be an enjoyable place with a sense of purpose, personal development and social interaction. The presentation "Achieving the Good Life and the important role of the workplace" shares some of the IEN Consultants company culture practices that we believe brings about happiness at work. IEN was invited to speak about "Eco-mobility: Towards Sustainable Lifestyles" at Universiti Teknologi Petronas (UTP) in Perak. The seminar was organized by World Wildlife Foundation (WWF) and had an interesting rostrum of speakers from Malaysia, Singapore, South-Africa, Denmark and the United States. Gregers (IEN) gave a presentation entitled "Reclaiming the Streets in Malaysia" and the many good reasons to do so including increasing the public health and the quality of life, as well as making the point that the most livable cities in the world has turned away from cars and instead increasing pedestrian and bicycling; examples include Copenhagen and Melbourne. IEN was invited to give a talk at the annual Technical JKR seminar (Seminar Teknikal Kejuruteraan Mekanikal 2017) organized by the JKR Mechanical Depart. Gregers (IEN) gave a talk entitled "Innovative Solutions for Energy Efficient Buildings" and briefly mentioned that IEN were also the energy efficiency and green building consultants for the new JKR headquarters, Menara Kerja Raya (formerly KKR2 Tower), which is one of the few office buildings to obtain the highest green building certification, GBI Platinum final certification (CVA). IEN wrote the article "Life Cycle Assessment (LCA) for Buildings" for the GreenPlus magazine (September 2017 issue). While LCA is still in its infancy in Malaysia, the article references how LCA in the building sector is clearly on the rise world wide, for example, with LCA being incorporated in the latest version of the American green building certification scheme (LEED). The article, which was co-authored with Alexander Graul, gives an introduction to LCA and the six most used parameters 1) Global warming potential, GWP 2) Depletion of stratosphere ozone layer, ODP 3) Acidification of land/water, AP 4) Eutrophication, EP 5) Formation of tropospheric ozone, POCP and 6) Depletion of nonrenewable energy resources, PENRT. The article, also gives examples of applying the LCA method to ongoing Malaysian building projects and shows that for high rise office buildings and for shopping malls it is the structural elements of the building that account for the bulk of the environmental impact. When comparing the environmental impact of an air-conditioned Malaysian high rise office on a 50-year life cycle, 1/3 of the global warming is attributed to the building materials insofar the building is energy efficient. And with use of alternative structural building materials like cross-laminated timber (CLT), the environmental impact of the building materials can be significantly reduced. Eliza Goh conducted a very interesting, enjoyable and eye-opening “Happiness at Work” session at our company last week. The IEN management are of the opinion that happiness at work is very important, because we would like to have happy employees that find purpose, satisfaction and pride in their work. So, when we learned about Eliza’s “Happiness at Work” course, we welcomed it with open arms. Continuing collaboration on the joint 2-year Master Course on Green & Energy Efficient Buildings (MGEEB), for which IEN has been the lecturer since the onset of the course in 2011; link to the course (link). Undertake joint projects within the field of energy efficiency and renewable energy in the built environment. IEN to host Rosenheim students for internships in Malaysia. IEN to administer the measuring indoor thermal comfort measuring equipment and weather station purchased by Rosenheim University. The collaboration agreement was signed by the president of Rosenheim University, Prof. Heinrich Köster, and Gregers Reimann (IEN) on 23 June 2017 in Germany, and in the presence of Prof. Dr. Kreimes and Simon Flatscher; see group photo (click). IEN has been invited to speak at the Retrofit Asia conference focusing on energy efficient retroffitting for existing buildings. The topic of IEN's talk is on retrofit success stories including our case study where we achieved 53% measured energy savings upon completion of the retrofit. This 2-day conference is held in Singapore. IEN has collaborated with Universiti Malaya (UM) to establish a green roof at the Alam Bina building on the UM campus. The research aspects of this green roof project, which includes 70 edible plant species, is to document the increase in social activity level as well as the improved thermal comfort of this roof space following the implementation of the green roof project. Unlike most green roof projects, which have significant exposure to direct sunlight, the UM green roof space was deliberately chosen due to its high degree of self-shading from the surrounding buildings making daytime utilization realistic. Moreover, this roof was also chosen for its ease of accessibility to the building occupants as well as its good visual connection to the building offices, hence, significantly improving the biophilic quality of these offices. The research over the next several months will quantify the impact of this green roof project through measurements and surveys. - Dato' Dr. Kenneth Yeang presenting "The Past, The Present & The Future - Perspective of a Ecologist & Green Building Architect"
- Ar. Sarly Adre Sarkum presenting "Driving Green Buildings with Sustainable Architectural Design & Planning"
- Dr. Pimonmart Wankanapon presenting "TREES & Energy Efficiency Research - Thailand's Perspective"
IEN were invited by ASLI to be part of the Greater KL & Smart Cities conference to conduct a short presentation and partake in the panel discussion under the Smart Utilities Management session. The topic shared by IEN was Buildings in Smart Cities, which focused on the impact and potential of sustainable certified buildings in a national context. IEN has had the following manuscript accepted for publication in the Journal of Building and Environment, "Prediction of discomfort glare from windows under tropical skies"
Special Issue: Advances in daylighting and visual comfort research. Abstract: Discomfort glare is common problem in modern buildings that employ highly-glazed façades. Glare not only has negative impacts on occupant comfort but can also increase energy use in buildings. Yet a robust discomfort glare metric, particularly with regards to daylight, has proven elusive. The Unified Glare Probability (UGP), developed using 493 surveys under clear skies in Brisbane, Australia, shows promise as useful tool for estimating glare from windows. This investigation attempts to validate the UGP using a similarly large number of surveys under different sky conditions, different building types and demographics in the tropical climate of Kuala Lumpur, Malaysia. The study uses a similar methodology to the initial investigation of the UGP, using a combination of luminance mapping with a post-occupancy evaluation (POE) questionnaire on discomfort glare. A total of 341 surveys were collected from six buildings; three green-rated and three regular office buildings. Hypothesis testing of the luminance data collected in these buildings indicate that the ratio of window to background luminances are a more sensitive measure of occupant discomfort than ratios of window to task luminances. The results for the UGP show agreement in predicting discomfort from windows between both data sets using regression analysis. A simple hypothesis test showed discomfort was accurately predicted by the old UGP model for 69% of new surveys. The agreement between the two data sets for window glare enabled them to be combined into one massive data set of 813 surveys to update the UGP. The updated metric uses a logistic curve in place of the original linear transformation of the Unified Glare Rating (UGR) to prevent illogical values of probability being obtained from the metric. Note to users: To cite this article: Hirning, M., Isoardi, G., Garcia-Hansen, V. (2017) Prediction of discomfort glare from windows under tropical skies. Building and Environment 113:107 – 120, Special Issue: Advances in daylighting and visual comfort research. IEN has been invited to give two talks at the "Net Zero Energy and Net Zero Carbon Building Design" seminar. The title of the two talks by IEN are "Renewable Energy – and the case for Zero Carbon" and "Zero Energy / Carbon and Innovative Tropical Building Case Studies". IEN has agreed to sponsor and speak (tbc) at the 5th International Zero Energy Mass Customised Housing 2016 (ZEMCH 2016) conference. University of Kuala Lumpur (UniKL) has teamed up with University of Brighton, University of Southampton, University of Melbourne and two more to organise and host this conference. The Master of Green Energy Efficient Building (MGEEB) students, which IEN has helped to lecture and supervise, will be among the many presenters. A comprehensive write-up with several case studies of how daylight can be implemented in office buildings in the tropics. The article shows how daylight systems can be designed to provide the building occupants with a pleasant environment lit by diffuse natural light, which is very different from the typical facades where occupants suffer from glare and overheating. Another important issue addressed by the article is daylight responsive general lighting controls and the benefits of task lighting. Several of the case studies, such as the GEO building, ST Diamond building and the KKR2 building, are reference projects of IEN Consultants. Enjoy the read! IEN is helping MESYM to do a free screening of the documentary, Power to Change, is about the ongoing energy revolution in Germany. It's a film about a great vision — and the people turning it into reality: the rebels of our day. The future of world energy lies in decentralised, clean supplies stemming 100% from renewable sources. That is the message of the documentary Power to Change — The energy rebellion. IEN was invited to give a talk about building computer simulation and how simulation can benefit the building design process by informed decision-making. The presentation makes a compelling case for using building simulation, both to optimise the building performance (energy, daylight, rainwater harvesting etc) and also to minimise over-design (for example, over-sizing of the cooling system). As such, building simulation helps to decrease both the CAPEX and OPEX of building projects. IEN (Alissa Raj) has been invited to speak at the Smart Cities Conference. The title of here talk is "Low Carbon Cities Malaysia Programme", which includes a collaborative project lead by Carbon Trust. IEN (Alissa Raj) has been invited to speak at the Smart Cities Forum in Penang, where she will be sharing our experiences working with energy efficient buildings and low carbon urban planning primarily in Kuala Lumpur. The title of her talk is "The Case of Low Carbon Cities". IEN has purchase two air quality readers that are place indoors and outdoors. Both real-time readings are made available to everybody, so we all can know the current severity of haze in Kuala Lumpur. Just install the free Breathing Space app on your smart phone and scan the QR codes. The air quality device reads PM2.5, PM10 and calculates the air quality index (AQI). See attached presentation for more details. Human influence on Earth and its eco-systems is now so profound that scientists tell us we have entered a new geological age called the Anthropocene, where humanity's impacts will be visible millions of years into the future. This is astounding - and hardly sustainable! To lessen the human (anthropogenic) environmental impact and our all important effort to avoid irreversible catastrophic climate change, the built environment plays a key role. Not only does forty percent of the World's resource consumption relate to the built environment, but this is also the sector with the biggest and cheapest greenhouse gas emission reduction potential. Moreover, people spend about ninety percent of their time indoors, so let us make our time spent on this Earth worthwhile by designing buildings and cities that cater better to human needs as well as being environmentally friendly. There's a common misconception that it is expensive to build energy efficient, green and healthy buildings. The truth is quite the opposite, as proven by our company's vast track-record. And the case becomes even more compelling when factoring in human health and long term effects of climate change. The choice is clear: Build green! MyHIJAU is Malaysia’s official green recognition scheme endorsed by the government of Malaysia, bringing together certified products and services that meet local and international environmental standards under one single mark. Completed in 2015, this 37-Storey high rise government owned and occupied Menara Kerja Raya recently became only the 2nd new building, in the non-residential category to be awarded the prestigious Green Building Index (GBI) Platinum final certification. The other building being Energy Commission’s Diamond Building in Putrajaya. Standing at approximately 175meters tall, this tower houses a total of 1,600 staff from the Ministry of Works as well as Public Works Department (Jabatan Kerja Raya) Malaysia over 53,000 square meters of building floor area. The offices of the Minister of Works as well as the Director General and Deputy Director General of the Public Works Department have also been moved to this tower. Achieving GBI Platinum final certification is no simple feat for any building. The building incorporates many features to reduce energy consumption, improve occupant comfort, reduce impact of material usage as well as make use of less treated potable water. Although the tower design incorporates floor to ceiling glazed facades which are exposed to the East & West orientations, it manages to reduce solar heat gain by employing triple pane insulated low-E glazing. Coupled with efficient lighting design with a low 8W/m2 lighting power density and automated control which effectively turns of 40% of the office lights during daytime, as well as air conditioning system that is able to reduce fan power down by more than 50% on reduced load days, the building achieves a very respectable BEI (Building Energy Intensity) of about 90kWH/m2year, which is about 60% lower than buildings that are design to merely meet MS 1525 guidelines. This saves the Government approximately RM2.5mil per year in electricity charges at the current energy rates. Overall daylighting strategy played a huge role in creating a unique and much comfortable indoor environment in this building. Custom perforated venetian blinds, low height workstation and glass partitions for private offices and discussion rooms all work together to create an open well daylit office space that is so much more inviting and conducive to the occupants. With these strategies, we have verified that usable daylight levels are achieved up to 6meters from the facade, which allows the automatic shut off of lights over these areas. This tower is also one of the first building to incorporate a waste water treatment system that is able to treat the greywater from wash basins, floor traps and ablution to be reused within the building for toilet flushing and landscape irrigation. A 400 cubic meter underground rainwater harvesting tank captures plenty of rainwater to be used for similar purposes in the building when there is rainfall. These strategies and the use of low flow fixtures at toilets and ablution, as well as significantly lower cooling load resulting in lower cooling tower water usage has managed to reduce water consumption per square meter floor area by 70% compared to another neighbouring JKR office tower. Menara Kerja Raya was officially launched on the 7th of December 2016 by Prime Minister Datuk Seri Najib Tun Razak. The Launch was covered by The Star ( click to read the article) and in the New Straits Times. IEN has been invited to give the keynote speech at the NZAAR international even series on "Natural and Built Environment, Cities, Sustainability, and Advanced Engineering". The title of the keynote speech is "Reclaiming our streets". The talk takes basis in the fact that a common denominator in the "Most Livable Cities" competition is that the winning cities deliberately have improved the cityscape for pedestrians and cyclists and deliberately have reduced car-based transport. Is such a development feasible in tropical Asian cities that are both rapidly expanding and have a hot and humid climate? The answer is yes, but it will not be easy. The talk explores some of the barriers to reclaiming the streets, which includes human/cultural barriers. The talk also points to some of the technical/planning solutions that make reclaiming the streets possible and when gives added benefits, not just in terms of making the city more livable, but also with respect to the socio-economic upside, particularly with respect to improving public health. IEN was invited to give two presentations at this roundtable conference with lighting experts from throughout Asia as well as from Australia and the US. The presentations by IEN were entitled "Application of Innovative Daylighting in High-Rise Buildings (Malaysia)" and "A Novel Glare Assessment Tool for Daylighting in the Tropics (Malaysia)". The latter was a preview of the first tropical daylight glare prediction model. The conference was funded by the Asia-Pacific Economic Cooporation (APEC) and was hosted by the Prof. Dr. Chanyaporn Chuntamara and Dr. Acharawan Chutarat from King Mongkut's University of Technology Thonburi (KMUTT). The other co-hosts of this program are Tongji University and University of California at Davis. IEN was invited to give a talk entitled "Innovative Energy Concepts for Buildings in Tropical Climates" at the International Conference on Renewable Energy Asia 2016. The theme of the conference was Energy Transition for ASEAN Future and the topic of energy efficiency and/or energy storage in buildings had been included as an important element of this energy transition under the separate track entitled "Integrated Design of Architecture and Engineering". IEN is invited to give a talk about the greywater and rainwater system installed at the KKR2 office building, which is targeting to score all the GBI water efficiency credits as well as targeting to achieve GBI Platinum. The IEM Mechanical & Electrical Forum talk is given at the Institute of Engineers, Malaysia (IEM) and includes measured data and lessons learned. Interestingly, the measured potable water consumption of the KKR2 (Block G building) is 63% lower than for the neighbouring Block F building. IEN Consultants was invited to speak at the "Green Affordable Housing" conference in Hanoi, Vietnam. The talk was entitled "Expensive not to be energy efficient" (Chi phí đắt đỏ không có nghĩa là tiết kiệm năng lượng) and focused on the successful energy efficient building policies of Denmark, which include mandatory energy labeling of buildings and a building energy code that requires near zero-energy buildings by 2020. The presentation also showed successful energy efficient building projects by IEN Consultants in South-East Asia, where the additional cost for energy efficient and green buildings is about 3% of the construction cost and the payback time only about 3 years. Five Vietnamese television stations, Hanoi TV, VITV, TV Info, Invest Cable TV and Truyen picture, covered the talk by IEN and the conference itself. IEN was invited to speak at the Active House forum at the biggest green building conference in China. Active house is a green building certification scheme from Denmark that focuses on making buildings healthy, comfortable and energy efficient. The igebc12 conference (the Twelfth International Conference on Green and Energy-efficient Building & New Technologies and Products Expo) was held in Beijing, China. "Practicality and Performance of Daylight Trough in the Tropics"
A case study paper on the daylight performance of the pioneering daylight trough that was fitted in MK Block D. The daylight trough is capable of daylit the office space as deep as 6 meters sufficiently at its peak. With an impressive lighting power density of 1.90W/m2, the daylight trough design saves 39.2% of lighting energy over conventional lighting system. This paper further elaborates the practicality of working with such a system, including cost implication, design challenges and contractual difficulties. "Office Occupants' Mood and Preference of Task Ambient Lighting in the Tropics"
The paper reaffirms previous findings that the usage of task light has increased subjects' lighting satisfaction with paper work and overall mood significantly. Despite only 30% of recorded illuminance within MS1525 range, the increased in lighting controllability complements the wide range of illuminance preference among the subjets. A significant finding is also that lighting satisfaction is not correlated to illuminance level but correlated to the variation of illuminance level throughout the day, which shows the combination of task light and ambient daylight to be the most appropriate lighting system for the office space in the Tropics. CIE 2016 "Lighting Quality and Energy Efficiency"
Discomfort glare is a well known problem within the built environment. However very little research has been conducted on discomfort glare in purely tropical environments. This preliminary investigation focussed on the ST Diamond Building located in Putrajaya, Malaysia. In total, 68 surveys were collected during the investigation. The surveys consisted of a questionnaire as well as luminance mapping of the occupant’s visual environment. Luminance maps were analysed via Evalglare to calculate the Daylight Glare Probability(DGP) and Unified Glare Probability (UGP). It was discovered that occupants were more tolerant to potential glare than expected, most likely due to the high luminance uniformity from innovative daylighting strategies employed in the building. Occupant position in relation to the window had a significant effect on both glare indices tested. The UGP was much better at predicting glare for occupants further away from the façade. Type 2 (or false-negative) analysis was conducted on both glare indices. A false-negative result occurs when the survey response was “uncomfortable” but the index being tested predicted “comfortable”. The method showed promising results for UGP in the case of the ST Diamond Building, with an index threshold of 0.35 required to achieve 95% accuracy in predicted comfort. The DGP required an index threshold of 0.07, which may be impractical to implement in lighting design. The conference theme is "Better Places for People", making human well-being the center point of our urban development. The conference is jointly organised by MGBC (Malaysian Green Building Confederation) and WGBC (World Green Building Council). IEN worte about the hidden cost of traffic jams in Kuala Lumpur and how 1 million hours is wasted in KL traffic every day. The article was printed in The Star newspaper. IEN has the pleasure of taking part in the 1st Earthship building being built in Malaysia. We took part in a design brainstorming session, as well as in the volunteering for the construction of the Earthship, which consists of two residential dome-shaped homes and one community hall for up to 50 people; both of which is built for the Orang Asli near Kampung Chennah (about 2 hours drive into the jungle east of Kuala Lumpur). The project should be completed before the end of 2015. The Earthship concept is very appealing with respect to sustainability. An Earthship - like a spaceship - seeks to be fully self-sufficient with energy, water and food. Moreover, Earthships are often built by recycled materials like use car tyres, used glass bottles, used rice-sacks filled with soil etc. In other ways, Earthships really push the sustainable agenda. Read more about the Earthship concept here (link). IEN was invited by ACAT (Air-conditioning Association of Thailand) to deliver the keynote presentation on "Case Studies for Radiant Cooling in Hot & Humid Climate". IEN wrote about the staggering hidden costs of fossil fuels that primarily stems from adverse health effects to humans. The article was printed in The Star newspaper. IEN has been invited to speak in Malina, Philippines, at the Annual Conference of the Philippine Green Building Council (PHILGBC), which this year marks the celebration of the World Green Building Week, by the World Green Building Council. The title of the presentation will be "Expensive not to go green". The venue of this 1-day event is the SMX Convention Center, Pasay City, Manila. IEN attending "Industry Speaks" on the discussion "Does Cheap Oil Weaken the Case for Energy Efficiency?" Download IEN Consultant's input to the event "Does Cheap Oil Weaken the Case for Energy Efficiency?" The answer is a resounding "No", because fossil fuels are significantly underpriced in Malaysia as their true cost to society (pollution and adverse health effects) are not captured. In fact, even if oil was free of charge, one would still have to pay a higher price at the petrol station that one does today from the negative costs to society. Regina (IEN) is giving a talk on "Reducing Mains Water Use Through Rainwater Harvesting" with good examples from actual projects. She is also highlighting the relatively high non-revenue water level in Malaysia, which should be tackled co-currently with pushing for water efficiency and rainwater harvesting. Two additional Foldable Bikes for the IEN Office Now! IEN Office in Malaysia has been featured as part of the Malaysia's Green Office spaces in the latest FuturArc July-Aug 2015 issue. The 43rd volume talks about the biophilic space in the workplace. IEN has been invited to speak to architecture students of UCSI in regards to sustainable and passive design in architecture. This knowledge sharing session will explore into the fundamental topics such as regenerative design, going green holistically and low carbon design strategy. IEN has been invited to speak at the biggest green building conference in China with 50.000 participants(! ), namely "The 11th International Conference on Green and Energy-Efficient Building & New Technologies and Products Expo" (ICGEB). Our presentation and the conference program are available for download. IKEA CHERAS becomes the first retail type building in Malaysia to achieve GBI Retail Gold (Provisional) Rating. IEN Consultants, who are the appointed energy efficiency, GBI and LEED consultant for this development will now be focusing on the implementation process of the targeted credits and fine tuning of the building operation towards realizing the final GBI Retail Gold certification. IEN was invited onto BFM 89.9 radio to have a conversation with world-famous eco-architect Ken Yeang (T. R. Hamzah & Yeang Sdn. Bhd.) about the "Global Future of an Environmentally Sustainable Urban Environment". The interview will be broadcast in Jan 2015 on the Talking Heads show. The interview is part of program series "Green City Living". IEN has been invited to give a keynote address at the Green Buildings & Parks World 2014 conference in Kuching. We are also giving the technical tour of the Sarawak Energy Berhad HQ building, which is one of our projects as well as the first green certified building in Sarawak (GBI Silver). IEN Consultants is raising awareness about diabetes and how a green built environment can prevent this disease, which is rapidly growing particularly in Asia. IEN has been invited to man one of the booths at the KLCC entrance to the park from noon until 7 pm. Come and learn how you can avoid becoming one of the 10% of Malaysians suffering from diabetes - and watch the Twin Towers being lit in dark blue (the colour used for World Diabetes day). This year we conduct the module 'Designing for the Hot' in Malaysia and Singapore including visits to several of the energy efficient and green buildings by IEN Consultants, Transsolar and others. IEN has been invited to join the panel discussion on the topic "Mastering Sustainability through Green Projects". The program for the 2-day conference, which is held at Hotel Istana, is attached. IEN has been appointed as the international expert green consultants for the 99-storey Pertamina Energy Tower - the tallest building in Indonesia! The project is targeting Green Ship Platinum certification, the highest level of the Indonesian green building certification. For this project we are teamed up with the local green consultants Narama Mandiri in Indonesia. The international architect is Skidmore, Owings & Merrill (SOM) from USA. In May 2013, Tonasco commissioned IEN Consultants to carry out a Energy Efficiency consultancy for the retrofit of their soon to be new office at Bukit Jelutong, Shah Alam. The brief was simple. Tonasco was moving their current operations (Office & Production) to a new premise which would be 30% larger (by Gross Floor Area) but would like to keep the energy bills the same or lower than the current energy bill. The new HQ and production facility has now been in operation for long enough to publish the recorded savings. Gregers (IEN) will deliver the key note address for this 2-day conference "Value Addition through Greening: Build Green, Live Green". The two presentations given by IEN Consultants at the conference are "Not Expensive to Go Green" and "Lessons from the First Green Shopping Mall in Malaysia". The conference is organised by the Green Building Council of Sri Lanka, The Institute of Town Planners of Sri Lanka and Glide(Pvt) Ltd.
Talk: "Finding solutions while bound by constraints"
IEN has been invited to give an inspirational talk about how we find workable and sustainable solutions for our clients within the framework of the project at hand, which always have many constraints. Apart from the typical budgetary constraint (i.e. incurring additional cost), we also face physical constraints - particularly with respect to building retrofit projects and what modifications are physically possible - as well as human constraints / willingness to try new building solutions that people are unfamiliar with. We are giving the talk to the software developers at Dong Energy IT, who also are bound by a number of constraints in their daily work. IEN has made a collaboration agreement with the companies Triton & Green Source, Denmark. IEN is one of the partners in the RoCABT project and in charge of conceptualising the concept for the Center for Advance Building Technology to be built in Malaysia. More updates will follow as the project takes shape. IEN Consultants visited Dong Energy, the biggest Danish power provider with a very strong environmental profile having won the 'Environmental and Corporate Sustainability' prize under the European Business Award (2013). Dong Energy is rapidly shifting away from fossil fuels to renewable energy power, so by year 2040 renewable energy accounts for 80% of their power production. Already by year 2020, the CO2 emissions per kWh will have dropped to 0.26 kg CO2 / kWh. For comparison, peninsula Malaysia TNBs emissions are currently at 0.64 kg CO2 / kWh and increasing (some say it is at 0.80 kg CO2 / kWh already). Moreover, Dong Energy's IT department in Malaysia works on sustainable demand side solutions, including the so-called PowerHub project, which essentially is peak power demand management for big power consuming customers. Flexible demand-side management is a key to increase the share of renewable energy production in the power supply, as these sources often fluctuate (solar, wind, waves, tidal). The visit to Dong Energy was very inspirational, as Dong Energy is taking the lead and showing the way forward for other power utilities to follow. The ST Diamond building was featured on the front page of the quarterly ASHRAE High Perfomance Building (HPB) magazine. The building, for which we were the green consultants, was featured in part because the ST Diamond building placed 2nd for the prestigious global ASHRAE Technology Award, which is awarded to the building that most successfully implements innovative and energy efficient technology. IEN has been invited as speaker at the International Green Building Conference in Singapore. The topic of the talk is 'Lighting and Controls' and will draw upon the building case studies of daylight-responsive lighting controls that IEN successfully has implemented. One of our building projects has a measured lighting consumption of 0.56 W/m2 during office hours, which is 25 times lower than the code requirement. Interview in The Star with Gregers (IEN) about the socio-economic benefits of bicycling. Many people might find it surprising that bicycling saves the society more than RM 1 per km compared to driving. Moreover, regular exercise from bicycling will add 3-5 years to your life. As part of our annual company trip, IEN made an excursion to the sustainable Green School in Bali. We found this international school is highly inspiring - not only because it is built entirely from locally grown bamboo, but also because sustainability forms an integral part of the curriculum. For example, the students grow their own rice and vegetables on the school grounds - and most of the energy is produced onsite with solar panels and mini-hydro (vortex hydro). In order to render our support to this meaningful institution, IEN Consultants gave a donation to the Balinese Scholarship Fund, which allows the local students to make up about 10% of the student body. In return, we had our company logo and name carved in the bamboo of the main building of the school (see pictures). A Chinese version of the IEN website was launched following a successful business trip to China two weeks earlier. The Sarawak Energy Berhad (SEB) HQ has been awarded the GBI Silver certification in the final construction verification assessment (CVA). IEN is helping the development of this innovative product, which can redirect sunlight to light up dim rooms. This small portable sun-tracking mirror-wielding device, SunnyBot, redirects 7,000 lumens of sunlight to the location of your choice (equivalent to a single 500W halogen lamp). The reflective range of the device is up to 200 metres away, with an accuracy error margin of as little as 0.1 meter over 30 meters. IEN has purchased on SunnyBok and is hereby supporting Solenica to raise £200,000 via Kickstarter to step up to industrial manufacturing so it can bring the device market. IEN will be speaking at this regional conference about the commercially viability of going green for shopping malls. We will share experiences from the case study of Setia City Mall for which IEN was the green consultants and which is the 1st green certified shopping mall in Malaysia. IEN is teaching a 3-week module on "Energy Efficient Building Design" on this joint Master Degree program between University of Kuala Lumpur (Malaysia) and University of Applied Sciences Rosenheim (Germany). This 2-year degree (MEEBG) is taught for Malaysian students at the Kuala Lumpur campus and includes a 1 month stay in Germany as well. IEN took part in this creative event with brainstorming on ideas to create awesome solutions and apps for sustainable solutions for the society we live in. The Hackathon featured energy, recycling and air quality datasets, which were be available to participants to create and push solutions for a greener world. IEN pitched an app that would enable people to get paid to bicycle to work. The app was called Monec$e combining the word "money" and "exercise". IEN has been engaged as a technical reviewer for the European Union demonstration program to mainstream energy efficient buildings and renewable energy systems at a city level across Europe. The already completed demonstration projects show how to reduce energy consumption to 1/4 by reducing the energy consumption by 50% through energy efficiency and by supplying 50% of the remaining energy with renewable energy. Gregers (IEN) likes to tell people that he has upgraded from driving a car to driving a Yike Bike, namely a two-wheeled 100% electric foldable Yike Bike. And he means it! The magazine 'For Connoisseurs' contacted Gregers for their 'green issue' to do an article about his experiences as a Yike Bike user in Kuala Lumpur. IEN gave the opening presentation at annual Design Forum of PAMSC, Kuching, for which a record 200+ attendees. Gregers explained how IEN Consultants has successfully has bridged the gap between architects and engineers for several completed green building projects for which the energy and water consumption typically is reduced by 50% or more. The 1-hour presentation included six case studies of completed projects in Malaysia and the region including the recently completed new headquarters for Sarawak Energy Berhad for which the energy consumption has been reduced by 80%. IEN is on the scientific panel for the regional Sustainable Building conference 2013 in Singapore. The conference is organised by NUS and BCA and will take place 9-10 September 2013. "Bicycle – A Sustainable Commuting Tool"
Gene-Harn (IEN) had his debut as published writer with this co-authored article for FuturArc Magazine. The well-researched article gives a good overview of bicycle initiatives in Asia and beyond and makes a compelling case for bicycling as a sustainable traffic option that has been under prioritised most places. Now the IEN staff can both Build Green and Drive Clean! Two Yike Bikes for the office. The 100% electric bicycles are available for staff to use for their daily commute to the office. The bikes are foldable and portable and hence easily combine with public transport. Moreover, they do not add to the congestion and air pollution of the city. The energy consumption of a Yike Bike is only 2.3% compared to an average car, and the associated CO2 emission of the Yike Bike is only 6% compared to a car. The electricity consumption for a full 10 km charge only amounts to only 0.223 kWh, or just 8 sen (Malaysian cents). And with the Yike Bike no time or money is wasted on parking. IEN Consultants believes that electric vehicles are part of the solution to achieve a sustainable society. Hence, with the purchase of the two Yike Bikes, we are happy to extend our slogan to "Build green - Drive clean". IEN Consultants won the 'Best Paper Award' at the iNTA 2012 conference in Singapore for the paper "Movable Insulation for Natural Cooling of Roof Slab in the Tropics". The paper by Brian Klejn-Christensen, Stephanie Carr and Gregers Reimann is available upon request. The second presentation by IEN (Gregers), which was also well received, was entitled "ST Diamond Building: Sustainability by Integrated Design". Gregers (IEN) presenting two papers at the 4th International Network for Tropical Architecture Conference (12-14 Dec) in Singapore. "It's Not Easy Being Green" book available at IEN office. Gregers (IEN) is one of the contributors to the book made by two designers, Aart van Bezooyen and Paula Raché, exploring sustainability worldwide. The book is free of charge and twenty copies are available at a first come first serve basis. The book "The Cooperation" (2012) has been made freely available online and reviews the fruitful 16 year long cooperation between Malaysia and Denmark targeted at ensuring a more sustainable development in Malaysia. The book "The Cooperation" (2012) has been made freely available online and reviews the fruitful 16 year long cooperation between Malaysia and Denmark targeted at ensuring a more sustainable development in Malaysia. During the period, 127 projects were implemented with concrete results for the Malaysian environment and benefitial improvements for Malaysian society. The existence of IEN Consultants Sdn Bhd is a direct result of this cooperation program, as Poul Kristensen, the founder of IEN, was engaged at the energy consultant to make the building of the Malaysian Ministry of Energy, Water and Green Technology (KeTTHA) - also know as the Low Energy Office (LEO) building - a demonstration project for energy efficiency. This successful project, which reduced the energy consumption by 50% and had a payback time of 5 years, as well as several other of IEN's subsequent green building projects are featured in the book. The 1-day study trip to Singapore included three projects of which the newly opened and impressive Gardens by the Bay was the highlight. This 'reverse' air-conditioned greenhouse contains several sustainable design features, which makes the energy consumption similar to that of a normal office building. Gene-Harn (IEN) and Gregers (IEN) were both featured in today's front page news about the new regulations for electric bicycles in Malaysia. Both being avid Yike Bike riders they chipped into the debate. Gregers (IEN) was featured as the business profile for the month of November in the Expat Magazine. The new IKEA in Kuala Lumpur will targeting LEED Gold and GBI Gold certification. IEN won the bid as sustainability consultant and will also ensure that 35% energy savings and 30% water savings are met. Gene-Harn is an avid blogger about environmental issues and finds lots of his inspiration from his work at IEN Consultants. "Task Lighting & Daylighting - Efficient & Effective Workplace Lighting Solution"
"Yike Bike in Malaysia, A personal usage experience in the Malaysian Urban Context"
IEN took part in a workshop on low-exergy cooling systems, eg. floor slab cooling systems. We shared some of the measured data from the first office buildings operating with floor slab cooling systems in South-East Asia, namely the GEO Building and the ST Diamond Building (both by IEN Consultants in Malaysia). Speaker at "International Green Building Conference"
Visit the conference homepage for more information. "The Green Frontier: A Malaysian Journey"
Prime Minister Datuk Seri Najib Tun Razak launches the book "The Green Frontier: A Malaysian Journey" reviewed and sponsored by IEN Consultants. Article in "The Star" about the Yike Bike. Speaker at "Clean Energy Expo Asia 2012"
Visit the expo homepage for more information. "ST Diamond Building" receives the ASEAN Energy Award for "New and Existing Buildings"
Visit the links for more information about the project, read an article from "The Star" and to see photos from the award ceremony. Gregers (IEN) will be talking about and demonstrating the 100% electric Yike Bike at "Green Drinks". IEN Consultants worked under the contractor, Hexagon Holdings Berhad, for the main administration building to achieve this certification. See the project description page for more information about the project. Visit the links to read more about the Yike Bike. The papers by IEN Consultants were presented at the conference "The 3rd Annual Tropical Subtropical Green Building Alliance Conference".